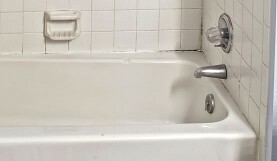 Plastic bathtub refinishing is similar to the process of refinishing and repairing porcelain and fiberglass bathtubs. First, the surface must be chemically cleaned to remove any soap scum, mineral deposits, or body oils. Next, all cracks and chips are filled and sanded smooth. Then Miracle Method’s proprietary bonding agent, MM-4, is applied to ensure that the new finish adheres to the old surface. Finally, several layers of acrylic enamel are applied to restore the original beauty of the tub. This dingy plastic bathtub was given new life with Miracle Method Refinishing! As with porcelain bathtubs, Miracle Method goes the extra mile and buffs and polishes the cured surface to deepen the gloss and give you the like-new look and feel you want in your bathroom makeover. 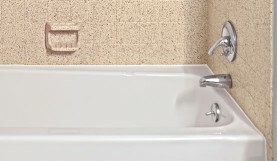 All Miracle Method offices are prepared to solve your plastic bathtub refinishing needs, from chip repair, color changes to complete surface restoration.